Choosing cutlery can be a challenge because it all looks good – the trick is to determine which knives really perform well over the long haul. If you have ever owned a Global® knife set then you have some appreciation for quality craftsmanship and construction; if you have used a good quality pair of cutting or poultry shears then you know how much better they are than the basic models. Much of what distinguishes good and better quality cutlery is in the design and materials – Global kitchen knives are made of stainless steel and feature one-piece construction which is truly revolutionary. A one-piece knife is exceptionally clean and easy to care for – knives must be kept clean to prevent germs and bacteria yet knives should not be submerged in water for any length of time nor should they go in the dishwasher. This means that knives are generally wiped clean with a damp cloth and then towel dried; it’s important the knife be as smooth as possible with no irregularities which might harbor germs. 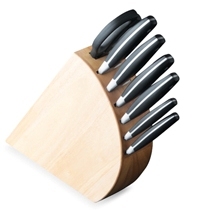 By choosing a one-piece knife over one held together with rivets you are choosing a knife that is easy to keep clean. Global brand knives in particular are exceptionally well-designed; much like a Samurai sword each knife is carefully weighted to ensure proper balance in the hand. They are made from the finest stainless steel material and hold a razor sharp edge longer as well as resist rust, stains and corrosion. More important, they are specifically designed to appeal to the professional and amateur chef alike.